When you have a baby with colic, you’re desperate to try anything to help soothe her into comfort. It can feel very defeating when you try to calm your baby and nothing works. Babies with colic are crying for a number of physical and neurological reasons, so trying all of the techniques possible until you find some that help is really the best game plan! Just know, though, that your baby will naturally grow out of the colic crying and will become a calmer, happier baby despite the rough beginning! Babies love and need the closeness of parents. If your baby is inconsolable, and you’ve already met her basic needs, wrap her snugly into a baby carrier and wear her as you walk around the house tending to things. Or go for a walk around the block for some fresh air. Even if she’s crying, she’s happier to be close to you. Baby doesn’t like being in a carrier or wrap? See How to Wear a Fussy Baby. Get your baby as ready for sleep as possible (new diaper, swaddled snugly, full belly, dim lights) and try out some repetitive movement to calm and lull your baby. What might work one time might not always work so have a variety of tricks up your sleeve. Bounce gently on an exercise ball, rock in a rocking chair, walk around the room, stand and sway, or try a motorized baby swing or vibrating bouncy seat. You may not think you have a stellar singing voice but your baby loves it! While rocking, softly sing some simple songs and lullabies. Pick some that you won’t mind singing over and over, because if one song works, the odds are you’re going to keep singing that one! 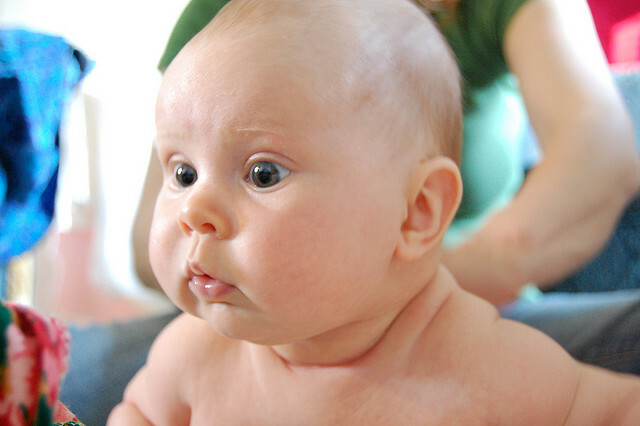 Babies love the sound of their parents voices, so an alternative to singing is just to talk! Tell your baby an elaborate story as you rock him to sleep. Even if he is crying, keep talking calmly and he might start to slow his crying and listen. It’s amazing when that happens. Providing a constant, soothing white noise is usually helpful even for babies without colic. It helps block out the other noises going on around them so they can relax and don’t become startled. You could buy an actual white noise machine, or use an air purifier or a small fan. For a list of white noise products, see Baby White Noise Solutions. Made with soothing herbs such as ginger and fennel, Gripe Water can help ease discomfort from hiccups, gas, tummy pains and even teething. In the womb, babies are crammed in there very snugly and that secure pressure is what they’re used to! The freedom of movement, openness, and startling reflexes of their limbs can be strange to them at first. Perfect your swaddling technique with a muslin blanket, or try out one of the baby swaddling wraps on the market. Sometimes what seems like colic is actually intolerance to certain foods that you’re eating (dairy, acidic foods, etc) or the formula you’re using isn’t agreeing with them. If you think their discomfort may be linked to their milk, talk to your doctor to work out a plan for a diet change. Birth is complicated and babies can be born with some physical discomfort due to the trauma of birth or c-section. If you are concerned your baby is uncomfortable beyond the basic needs, chiropractic care is an option to consider. Find a Chiropractor in your area who has experience working with young babies and get their professional opinion. Sit your baby up and give them a good, thorough burping session after each feeding. You can even do this in between switching from one breast to the other, or halfway through a bottle. Burps that don’t come out can turn into tummy discomfort later, so don’t forget to burp! Bonus points for laying baby belly down on a warm towel. Not only is it comfortable but it will relax their bellies enough to release their gas! Soft, gentle infant massage is both soothing and stimulating to your newborn. Look into taking a class at your local hospital or search the web for some baby massage basics and see how your baby reacts. If they start to relax, focus on areas such as the feet and belly to help them release gas. If they fuss or turn away, end your session and try again later. There is no magic pill for curing colic; it’s a phase that will pass with time. Work your way through the list and listen closely to what your baby tells you as he reacts to things! You’ll slowly find what works to help get you through the trials of a colicky baby. And then you’ll feel like you can do anything! Megan is a natural living enthusiast, photographer, and freelance writer from a little town on a hill in eastern Michigan and enjoys contributing to the SmartMom blog. She is a mom to an energetic toddler girl and together they’re always seeking out new projects and ways to play and learn together. She loves connecting with other moms, sharing tips, and helping others learn to live more simply and naturally. To get advice from moms like Megan, download the SmartMom app.